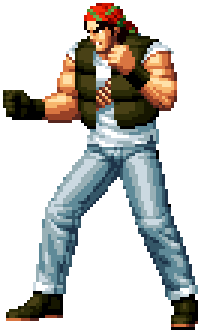 Ralf Jones (ラルフ・ジョーンズ) is part of the Ikari Warriors mercenary agency. He is currently under the orders of Commander Heidern and the superior commander to his good friend Clark Still. His first meeting with Commander Heidern occurred in a secret operation in the Amazon jungle (in Brazil, together with Clark Still). Their helicopter crashed, and they had to venture alone in the jungle. After The King of Fighters '97 , Ralf and his friends focused more on other operations. However, Commander Heidern soon assigned the Ikari Warriors to investigate the force behind the tournament this time around. This page was last edited on 21 November 2008, at 18:23.